We are always available to assist with your enquiries. Will I lose my Manufacturer / Dealership Warranty if I come to Blakehurst Auto Repairs for my Log Book Service? No, your statutory Warranty will not be affected if you bring your vehicle to us. We use premium quality genuine parts and lubricants and stamp your service book. Read more about our Log Book Servicing & Tuning. I need tyres for my car - can you supply and fit? 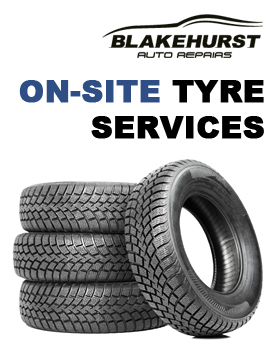 At Blakehurst Auto Repairs we offer On-Site Tyre Services which Supply, Fit and Electronically Balance and Align tyres in our workshop. We also provide a Puncture Repair service. We can source a large variety of tyre brands to suit your needs. I want to buy a car from another State. What do I need to do to register it in NSW? You will require a Blue Slip. A Blue Slip is required by the RMS to confirm the car is roadworthy and safe to be driven on NSW roads. We also do motorbikes, trailers and caravans as well as LPG vehicles. Bookings are essential for Blue slips, so please phone to make an appointment. I have a Ford FG XR6 and want to make it go a bit better, what can you do for my car? We have another division as part of our workshop – Blakehurst Automotive Developments is another division of our workshop which specialises in custom Dyno Tuning and performance upgrades. We utilise a state of the art Mainline Chassis Dyno and Dual Retarder which has the capability of 2400 hp and 3400 nm of torque. We use software to remap your factory computer. A tune and remap will improve performance, driveability and general fuel economy. There are endless performance possibilities depending on your requirements and budget.